Season 3 Registrations Will Be Opening Soon! Stay tuned, Season 3 registrations will begin soon! You will be able to register in Hearts Enchanted or Alston camps. Registration is $600 and will be going 100% to the prize pool for winners. This year there will be 2 divisions to ease the number of matches. At the end of the season, the top 5 winners will be given prizes, and the top 2 teams of each division will have a playoff for the TFL League Winner. More info on the about page! THE SEASON 2 FINAL RESULTS! Congratulations to The Pansies for winning the league this year! It was an extremely close race, separated by only one win! A very special thanks to all of our teams who participated this season, as well as our sponsors who helped make this all possible! I hope everyone had a lot of fun, and will post more news and info about future league events and seasons here! THE FINAL WEEK OF THE SEASON! This is it, we're down to the final week of the season! There's potentially 12 points up for grabs! Currently the Pansies are holding on to a narrow 3 point lead, followed by the Fishin Fools. The UnderDogs are only 3 points behind them, and 3 points behind the UnderDogs are Crocodile Style and Bayou Brats. Dragon Hearts is holding on the the final gold spot, but MoFishMoFun are tied with them but just a little behind on total points. 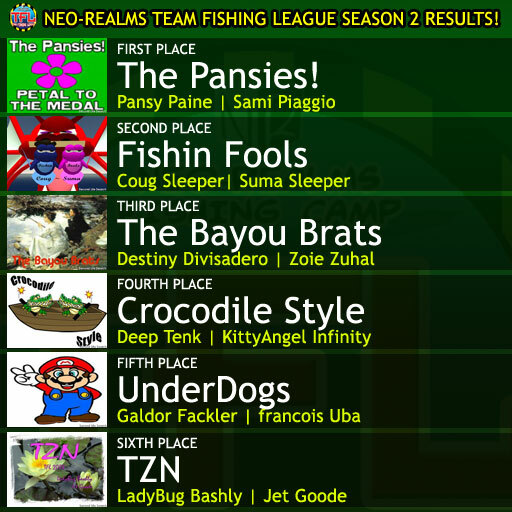 Just under them is a 5-way tie at 93 points with TZN, Bass Tards, Crazy Fishers, Epic Catches, and Woozl&Wildcat. It should make for an interesting final week! Two more weeks left of matches to be played, this next week due on 8/4 and the final week ending 8/11! Good luck to all teams!